The Oromo struggle is still at the crossroads. It either climbs out of the abyss or sink further into disarray. The year, 2010, begun with a grand betrayal— Licho Bukura, the Trojan Horse within the OLF leadership of 10 years, finally defected, bringing his destructive work for a decade to an abrupt end, and hands himself to TPLF with 200 OLF soldiers (mostly from Jijjiirama and some Shane, including his wife). The most hopeful sign was the decision of OLF factions to unify after two years of bitter acrimony by signing a landmark agreement. This is indeed a positive development, but the concern about the unity of Oromo freedom fighters still lingers as the much talked about unification is yet to take off the ground. Unification aside, the monumental question pertains to the direction of the struggle. So far, the debate about the future of the Oromo did not go past sloganeering, an exercise in futility and wastage of valuable energy, time and resources. Should we look forward or backward for inspiration? Which way is which? Is the road ahead “Kaayoo Ganamaa” or “Gadaa Democracy,” with the idea of the big tent symbolized by the sycamore tree under which multitudes could take shelter from the scorching sun of tyranny and endless conflicts? 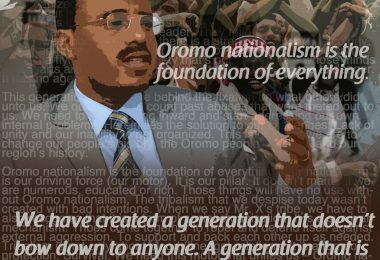 Gadaa has its roots in Oromia but democracy is a universal ideal, not just for the Oromo. Can the two be strategically combined to answer the yearning of all for freedom in Ethiopia? Organized Oromo voice and independent media is totally silenced in Oromia. The infighting in the Diaspora has hit the rock bottom and the constructive mood is showing some signs of revival. A true unity among the feuding OLF factions, the dream of millions, will undoubtedly rejuvenate the struggle. Unity devoid of renewal and a choice of a clear direction, a clean departure from the past, would, however, be too little too late. The Oromo, inside Oromia, largely remains resilient and upbeat. Would OLF wake up to seize the opportunity or continue with its current state of self-mutilation, self-destruction and paralysis? The wish for transformational leadership, charismatic would be better, continues. But unable to nurture one to the point and mercilessly devouring the very few imperfect ones trying to fill the void, especially among the Oromo diaspora, the community is fast becoming leaderless. We literally live at an age when the Oromo has no leaders to look up to; not for lack of leaders, but for the cannibalism. We have effectively become a society in which mediocre people vying for leadership are preoccupied not with bettering themselves but rather dirtying anyone better, a recipe for a crisis of leadership, a crisis without overcoming of which a society cannot properly respond to the challenges of the times. OPDO’s hopes for replacing Meles or positioning themselves to assume the TOP GUN, should Meles’ expire, were dashed. Abba Dula earned some grudging respect, a remarkable redemption for a man so maligned. He strived hard only to slip at the finale, falling down with a dud. The OPDO as an organization was and still remains a TPLF work of art. The final decision is not with the Oromo; Meles remains the puppet master. However, like it or not, OPDO has undeniably become a hotbed of Oromo nationalism, more so at its base. The increasing assertiveness is, despite the setback, a hopeful sign. The growing Oromo student population is the most potent political force. It has been silent since 2004. Now that Abba Dula’s numbing lotion has worn off, would it be restive or remain docile? Economic and political woes abound; the student movement must take transcendental approaches, and become self-reliant as the future of the country may very well depend on it. Medrek, an amalgam of conflicting individuals, groups, ideologies, legacies, ambitions, and what not imploded in 2010, unlikely to recover and rebound any time soon. Down to six as two of its founding coalition members have defected, it is rumored that the talk on merger is deadlocked. An alliance forged to defeat EPRDF at the ballot box, the election result couldn’t have been any more bad news. With a sole MP in the rubber-stamp parliament, Medrek is all but a ghostly spirit. On the positive note, Medrek has withered away but not before irreparably proving Meles’ democracy to be a naked totalitarianism. The TPLF itself is shaky. It is on a slippery slope, a downward spiral due to diplomatic challenges, drought (famine), and backlash from the public on account of deteriorating standard of living that has taken firm root. Zenawi’s model of development without freedom is showing a crack because it espouses the wrong premises. It has built many nice buildings but alas on a foundation of shifting sand. Oromo scholarship is at its weakest. In an organized form, it is hard to say there are any serious Oromo scholars today. No plausible answer to the Oromo paralysis lasting 20 years. No answer for the infighting. No major theme, theory, paradigm, and perspective or formula. Would the 2010 Oromo Studies Association’s 25th Anniversary commemorative conference usher a break with the past and show some signs of pragmatism? So we hope. Oromo Art and culture is showing a revival. But still leaves much to be desired. 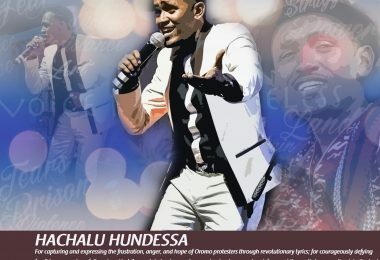 While living under the grip of a venomous snake, Oromo singers continue to lead the way. Among the most notable in the year 2010; Jambo Jote, Hacalu Hundesa and Diribe Gada top the list. On the cultural side of things, Ireechaa has become a national holiday, and a global renaissance. A regional holiday in Oromia, with continuity and coordinated effort, it is sure to earn a place in the Guinness Book of World Records as Africa’s biggest open mass celebration. Afan Oromo, the third most widely spoken language in Africa, is talked of to be adopted as an official (national) language in Ethiopia. Still in its formative years as a written language, in the brief 20 years, much has been achieved and much remains to be done. 2010 did not see a major literary work, be it of poetry, fiction, drama, film etc. Linguistic scholars and educational institutions in the country should work more on that front. Standardizing and integrating Afan Oromo into modern technology its key to its development. QC’s last ditch attempt to revive itself after a decade of slumber is smoldered by the combined efforts of TPLF and Kenya. Instigated by the kidnapping of a Kenyan MP and the alleged killing of Kenya police officers, it is a classic case where a desperate search for publicity goes wrong, and proved diplomatically disastrous. Now the Oromo refugees have to bear the brunt of the backlash. The regime of Meles Zenawi faces both internal and external vulnerabilities. Externally, at large trying to climb two trees (West and East-China), close to home also trying to climb two trees (befriend both Sudan and South Sudan). To divert attention away from an embarrassing pre-cooked election results, Meles is touting a water war with Egypt. Openly bragging about his defensive capabilities, “nobody who has tried that has lived to tell the story”, Meles alleges to have evidence that Cairo has been supporting rebels fighting against his regime. How would Africa and the world welcome the newest nation state, the New Sudan (South Sudan)? A decision time sure to split Africa’s largest country into — the Arab (Muslim) north and the Christian (animist) south— is just around the corner. Whether the North will accept the referendum is an open question. Also, would the South remain one? At the now likely return to civil war, would the so called international community act in time to stop a potential humanitarian crisis? Somalia remains Africa’s open sore. The only difference from 2009, coordinated campaigns by the world’s powerful naval forces on Somalia’s shore have contributed to less piracy related headlines. The Transitional Government of Somalia marred with corruption and unfit to govern, controls a tiny portion of the country’s capital with the help of AMISOM. Insurgents seem to be making or attempting a comeback. The twin bombing in Uganda worries analysts as a potential spillover. Kenya is emerging out of the crisis of 2006. 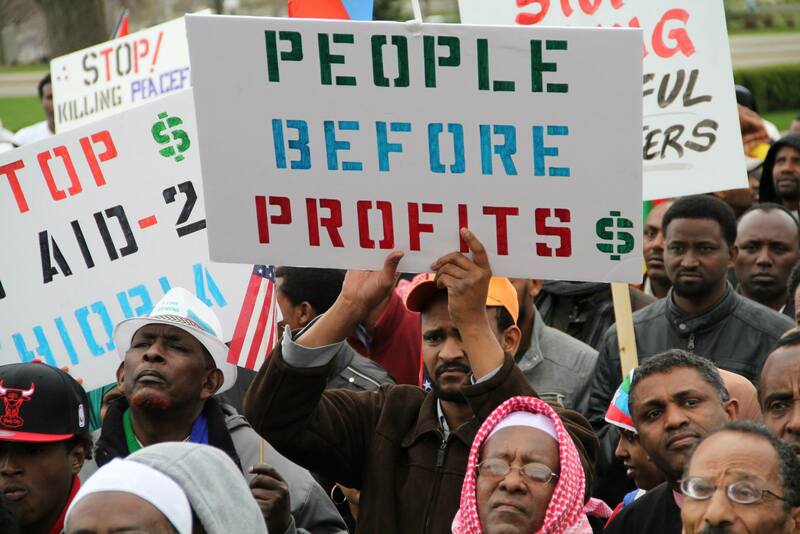 Eritrea suffers from economic meltdown, and brain-drain. Its allies are increasing in numbers yet the regime faces discontent from Ethiopian groups it has housed for the last decade. For the first time in the history of the sport, FIFA held the 2010 football (called soccer in the states) in South Africa. It was long time coming. And sure enough, South Africa surpassed expectations and reaffirmed an African nation can indeed organize the grand event. African teams stumbled from the get go with only the intrepid Ghanaian Black Stars holding up for a longer while. In the U.S, soccer became a whole new ball game – the talk at dinner tables. Didn’t Obama sneak out of the G20 summit to catch one of the U.S games? For the second time, in a hard fought game, Ghana sent home star player London Donovan and Team USA, crying. Then again, they let up in the match against what’s their name, Uruguay. Spaniards celebrated win, France embarrassing participation, England and Argentina’s unexpected elimination, Brazil and then the psychic worm, Paul the Octopus –let’s leave it there, shall we? Would an African team finally win the world cup in Brazil (2014), Russia (2018) or Qatar (2022)? The Obama presidency is in its second year. Much has been achieved and much has been made out of it. The midterm elections showed a shift/turn to the Right. Tea party activism skyrocketed. Economic worries are still a paramount issue. China’s takeover as world’s biggest economy has sent shivers to lawmakers alike. The escalation of Afghan war, economic slowdown (recovery is not paced enough), lack of landmark reforms (immigration) and the trend towards the right are sure to affect Obama’s reelection bid. Overall, is the world shaking off the throes of recession? The last year in the first decade of a new century was dominated by economic worries. European nations such as Greece and Ireland had worst times selling austerity measures leading to wide riots. It is a sure bet that China, India, and Brazil are becoming the new, future, economic giants. Lastly, in the life of OPride, 2010 was an epic year. With your continued loyalty, readership and contribution, from an amateurish debut in 2008, we have grown to become the #1 Oromo website. Whether it is a non-stop streaming of the old, new, and classic Oromo music, in all its genre and variations, live broadcasts of Oromo forums, news stories, or analysis and commentaries, we hope, OPride has lived up to its promises. In the New Year, Hambaa, the Oromo literary art collection and preservation project will finally be released and with many more project ideas in the works. The three day service interruption in October was a major downer. But that was also caused by the unprecedented growth registered. Our New Year’s motto: We Want To Go Far, Lets Hop Together! Happy Holidays from all of us here at OPride.com! The writer said, OLF had no reason to kidnap an elder, who “was OLF supporter and still is.” Regarding the alleged killing of a police officer, the letter stated that “the Kenyan officer was killed in the battlefield while siding the Wayane army in fighting OLA.” The reader took particular issue with our characterization of QC’s efforts as a search for publicity. It concluded with an appreciation of what OPride is doing and encouraged us to continue with our work. OPride in hindsight realizes that referring to QC’s effort as a search for publicity is misplaced. We appreciate the comments.